This DIY whipped peppermint lotion is really special for anyone suffering with rough, scaly, dry “sandpaper” feet, making it a wonderful gift for yourself or any dancer you know. It can be used anywhere on your body and it is recommended to apply a generous amount to your feet with socks before going to sleep. 1. In small glass container, combine all ingredients except essential oils. 2. Place in saucepan with 1-1.5 inches of boiling water. 3. Stir ingredients until combined (around 5-10 minutes). 4. Once melted, remove from heat and let rest 3 minutes. 5. Add essential oils and stir. 6. Let mixture come to a solid. To quicken process, place in refrigerator. 7. Once solid, use an electric mixer to whip lotion. 8. Gradually come to high speed and whip for 3-4 minutes or until light and fluffy. 9. Place in a container. 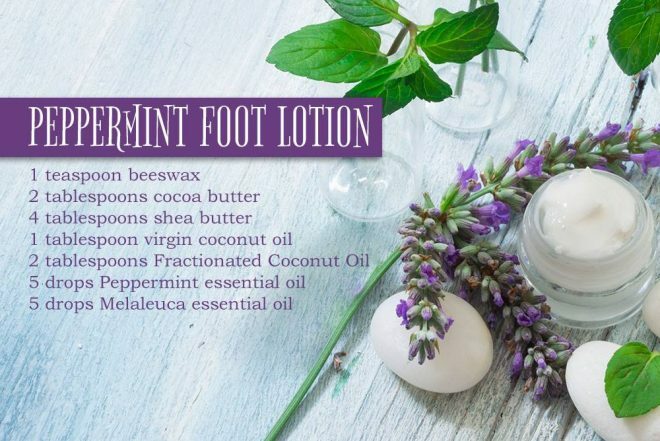 To use, rub on heels to help soften and soothe them. What has been your experience with DIY lotions? Is this something you’d like to try making at home? For a limited time, if you purchase a 15ml bottle of Melaleuca (retail $25) plus shipping, I’ll send you a 15ml bottle of Peppermint (retail $27) for FREE. Simply send $30 when you click on this link PayPal.Me/DanceAdvantage. Interested in other ways dancers can use essential oils? 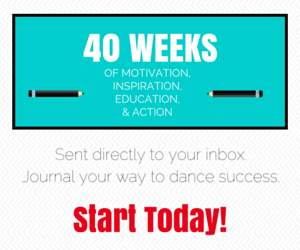 Sign up for Essential Oils for Dancers. I’ll send you tips and recipes and we’ll learn together!